Come See Us at Net Inclusion! Home Uncategorized Come See Us at Net Inclusion! 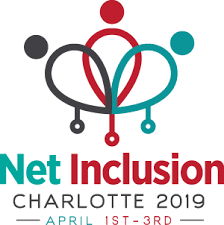 We’re very excited to lead two sessions (and participate in the Lightning Round) at this year’s Net Inclusion conference happening in Charlotte, North Carolina. Here are descriptions of each session with links to all presenters — we hope to see you there! Nonprofit digital inclusion programs, large or small, need a variety of funding strategies to survive and thrive. Successful program managers share their best practices and ideas for building support from funding institutions as well as the communities they serve. Providing assistance to the differently abled requires knowledge of accessibility hardware and software in addition to training strategies. What resources are available to support increasing digital access and skills of the differently abled? Bonus! Check out Kami Griffiths’ Lightning Round! Since our first Net Inclusion, NDIA has featured Lightning Rounds in plenary sessions as a way to shine a spotlight on dozens of great digital inclusion initiatives and to encourage peer-to-peer networking. Net Inclusion 2019 will feature four 30-minute Lightning Rounds, accommodating a total of 25 to 30 presentations, each with a four-minute presentation.